Professor Bryan Gaensler, Director of CAASTRO - the ARC Centre of Excellence for All-sky Astrophysics, based in the School of Physics - has won the 2013 Scopus Young Researcher Award for the Physical Sciences. 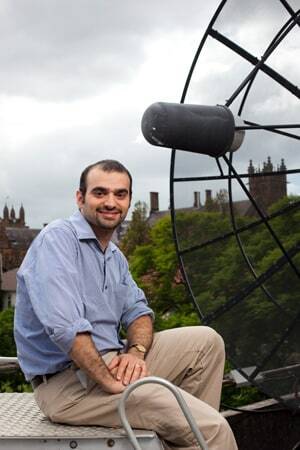 Professor Bryan Gaensler, Director of CAASTRO- the ARC Centre of Excellence for All-sky Astrophysics, based in the School of Physics- has won the 2013 Scopus Young Researcher Award for the Physical Sciences. The award and $1000 prize money from Elsevier will be presented to him on 13 September at the Scopus Young Researcher Award lunch at the Australian Research Management Society conference in Adelaide. The Scopus Young Researcher Award recognises researchers under the age of 40 who have a high publication output and high number of citations to their work as determined by Scopus, and who have had an impact outside of their field and who make positive contributions to their field or to the broader research community. The award has five categories: Physical Sciences; Humanities and Social Sciences; Engineering and Technology; Life Sciences and Biological Sciences; and Medicine and Medical Sciences. "Winning this award is a recognition of the hard work I've put in for many years, of the faith put in me by my mentors, and of the superb results of my enthusiastic team of postdocs and students," said Professor Bryan Gaensler. "I hope that the award gives me the chance to highlight Australia's outstanding achievements in astronomy and to showcase to the general public some of our astronomy community's innovative discoveries," he said. "As I just turned 40 a couple of months ago, this is probably the last time that anyone will refer to me as 'young'!" Professor Gaensler is internationally recognised for his groundbreaking work on cosmic magnetism, neutron stars and the interstellar medium, and at his young age, is already acknowledged as a dynamic and visionary leader in Australian astronomy, physics and science communication. Earlier this year Professor Gaensler was elected as a Fellow of the Australian Academy of Science, and is currently the Academy's youngest member. He has published 234 refereed scientific papers, with virtually all of these having appeared in the most high impact (A or A*) journals. He has been lead author on 41 refereed papers, including first-author papers published in the prestigious journals Nature (three times), Science, and Annual Review of Astronomy & Astrophysics. His papers have been cited by other researchers 5400 times in the last five years, which places him in the top one percent of astronomers worldwide. He has also edited two conference proceedings, and has co-authored over 300 refereed conference papers, unrefereed proceedings, meeting abstracts and circulars. "When you start off as a scientist, you're repeatedly told that it's all about publications: publish, publish, publish. But a successful career in research is about so much more than that - it's bringing in funding, training students and postdocs, changing the landscape, and setting strategic directions," explained Professor Gaensler. "Often pursuing these all takes a cost on your raw research output. It's great to be nominated for an award that recognises the whole spectrum of activities needed to be a successful researcher. "The Scopus Young Researcher Award is important because it plays a vital role in highlighting the fantastic achievements of Australia's next generation of researchers, and in giving students role models who will inspire them to pursue their own paths of inquiry."